The advantage of keeping your home’s decor neutral is the ability to change accessories up for seasons, events, mood swings, you name it! I started buying seasonal decor for my mantel to fill visual space and tie us over until our beautiful iron sconce lights are installed. These lights will no doubt become the focal point of our finished Living Room; however, until that day comes…why not just have fun with it? I started with the mirror, which I use as my anchor piece in each style (it will stay after the lights are hung). This mirror has a beautiful frame made of distressed, reclaimed wood. I added some extra flair by picking up a faux boxwood wreath at my local craft store. I cut a piece of burlap ribbon (leftover in my craft closet from the holidays). I used a piece about 12 inches long and attached the wreath to the mirror with the ribbon and a staple gun. Be careful to measure the thickness of your frame and the length of your staples…Oops! My first one shot right through the front! My mirror is extra “distressed” now, so learn from my mistake. Additionally, an iron wreath stand is used for every style. The stand was purchased at my local craft store and is height-adjustable. This versatile piece was about $30 and has proven to be one of my favorite purchases this year. 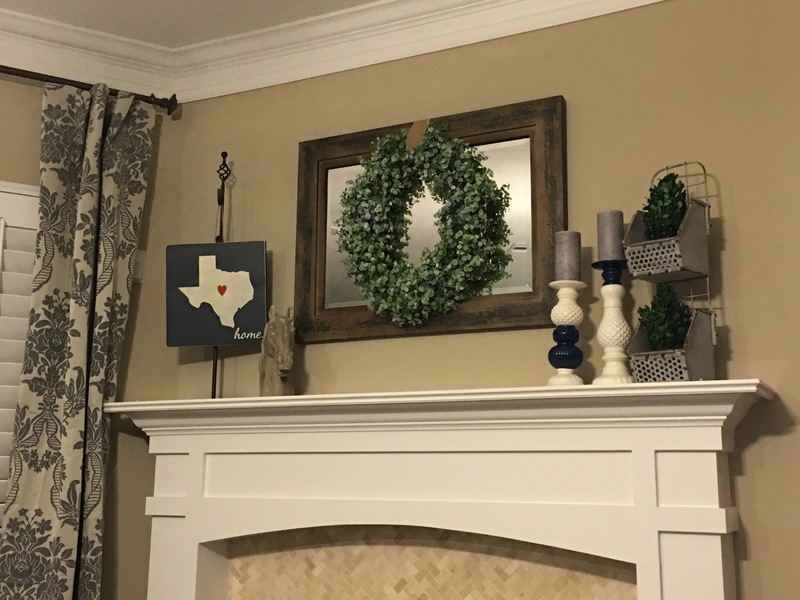 This mantel was inspired by the craze of all things “farmhouse” or “fixer-style.” This one is my “go to” look in between holidays, and it compliments the overall decor of the rest of my home. For added height (because everything is bigger in Texas! ), I hung the wooden sign on the iron wreath stand. At my local home decor store, I picked up some candles and their holders, along with the metal shelves and accompanying topiary accents. The horse bust is my favorite find. I found this baby at the grocery store, haha! Yep, it’s from Kroger! See, you’ve gotta keep your designer eyes peeled at all times. You never know when you will find the perfect picture frame or toss pillow next to the tater tots! This style is obviously all about LOVE! I hosted Bunco at my home for the first time in February. I amped up my Valentine’s Day decor a bit more than usual, but it turned out really cute. 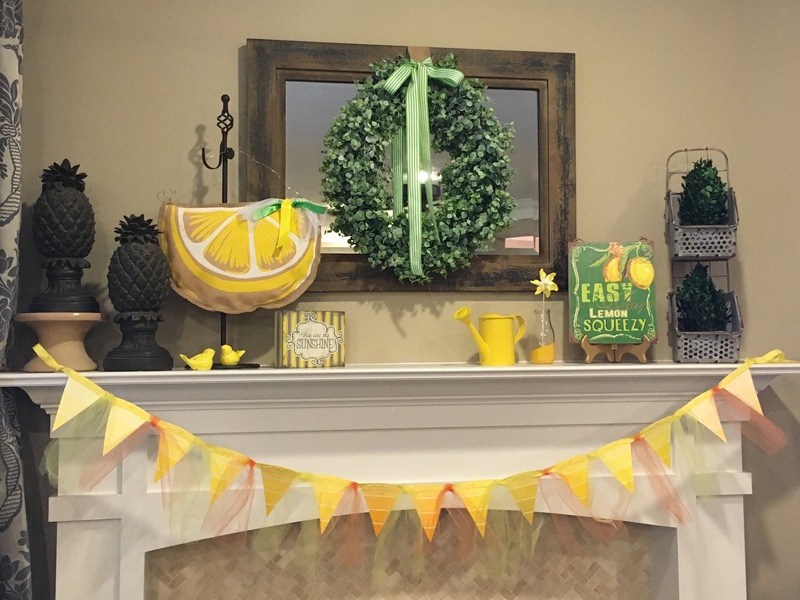 All of these decor items were purchased at my local craft store. Sweet and simple. I stuck with a rustic look to compliment the farmhouse style as well. My Spring/Easter look featured my favorite color for the season…MINT! Isn’t it lovely and refreshing? My mother collects bunnies and displays them all (hundreds of them) on her mantel for Easter. Additionally, her grandma name is “Bunny!” Therefore, I have a soft spot for cute bunny rabbits, and I have a feeling I will be adding more of them to this mantel over the years. All of these items are from my local home decor store. However, wrapping the topiary rabbit and egg tree for storage was not that fun. Hopefully, these items will be recovered in one piece from the attic for next season…fingers crossed! After hosting 3 baby showers and 1 wedding shower this summer, I will be sure to share photos and styling tips of these fun events very soon! Also, stay tuned for more mantel styles during the fall and winter holiday seasons. That is my favorite time of the year, and I can’t wait to shop for those looks! Sitting Pretty Redesign would love to help style your home for any holiday or special event. Contact us today! Previous Post What is e-Decorating? Next Post Going Coastal in Style!